Understanding the significance of blood pressure can be tough for an individual who is not from a field of medical science or has no experience of working with someone from the same field. The Blood Pressure Chart Templates can be very useful for understanding whether the blood pressure is high, normal or low and its impact on the body. These printable blood pressure charts are useful chart templates that can help you in understanding blood pressure in a better manner. This printable blood pressure chart can help you in understanding whether your blood pressure is high or low based on the systolic and diastolic readings and how you should handle high blood pressure. 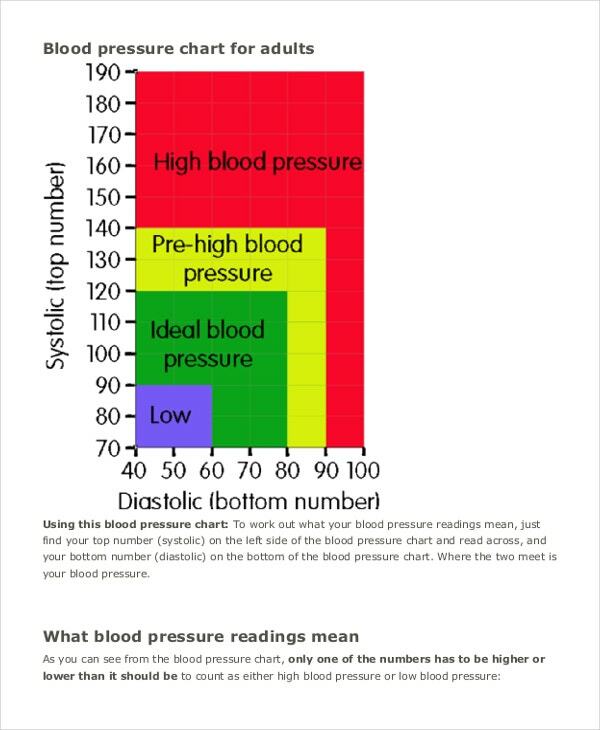 Blood pressure chart can be useful for keeping track of systolic and diastolic pressure of an individual taken at regular intervals over a significant period. > Who Can Use the Printable Blood Pressure Charts? The printable blood pressure charts can be used by individuals as well as doctors and nurses for using them in their clinics and hospitals. Hospitals and nurses can make use of these charts to explain to their patients the significance of their blood pressure to make them fully understand how it is affecting them and what changes in their lifestyle are required to keep it reasonable. 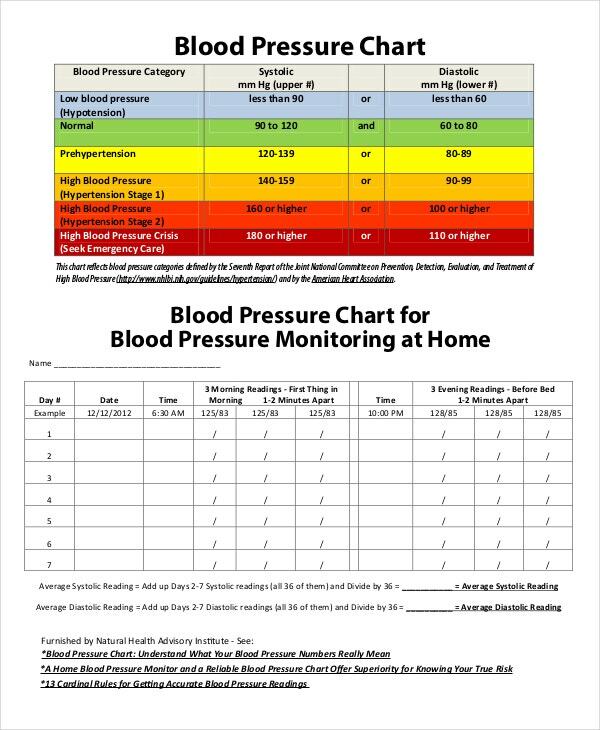 Individuals who have machines to monitor blood pressure in their homes can make use of these Blood Pressure Chart Templates to understand the proper functioning of the equipment and to understand the readings that appear on the equipment after it measures their blood pressure. This is a printable blood pressure chart which can help you in understanding the significance of the readings you get from the equipment which is designed to measure the blood pressure of an individual. This printable blood pressure chart gives you guidelines on properly using the equipment which has been designed to measure your blood pressure. It has been designed for such equipment which can be used by individuals at home. > How to Use the Printable Blood Pressure Charts? The printable blood pressure charts are to be printed on a sheet of paper and stuck on a wall or someplace where you can use it as a reference for understanding your blood pressure. 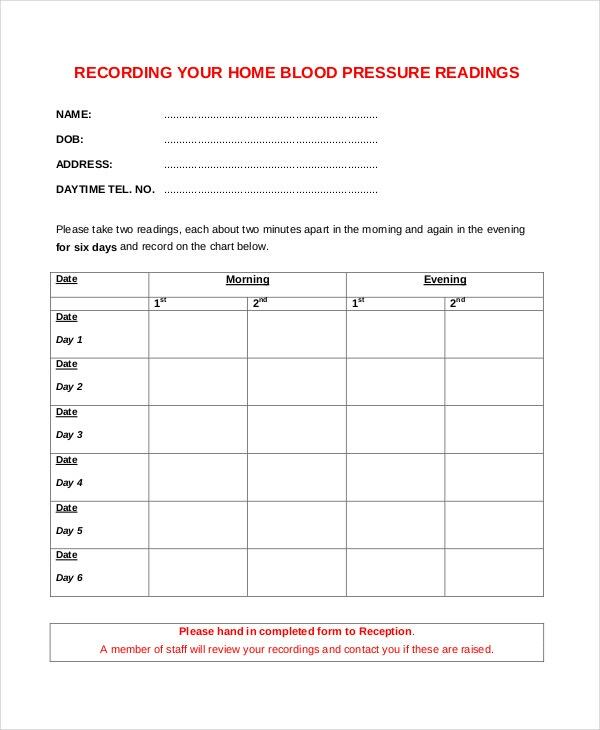 Some printable blood pressure charts are made for record keeping purposes. 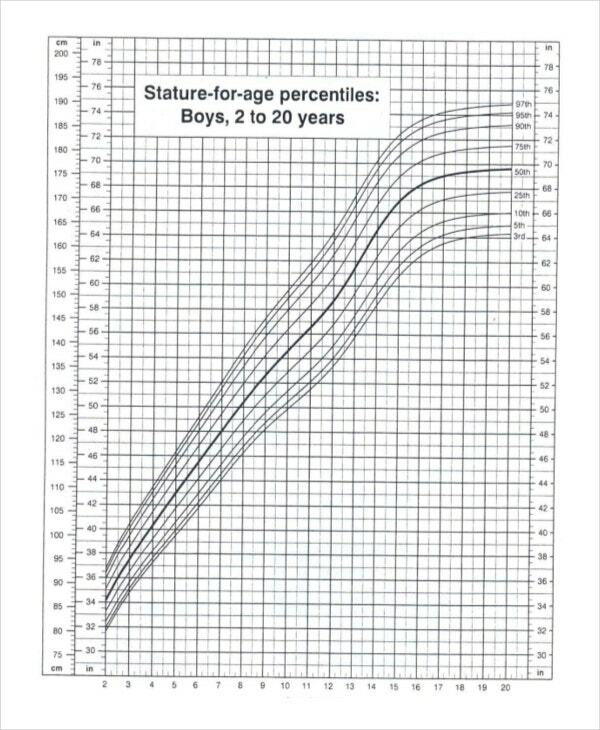 On these charts, you have to note the systolic and diastolic readings you get when you measure your blood pressure in certain regular time intervals. Printable blood pressure charts are also to be used as a reference to understand the significance of the systolic and diastolic readings, to infer whether the blood pressure is normal, high or low and to understand what one should do in the latter two cases. >What are the Benefits of Using Printable Blood Pressure Charts? There are various advantages of using the printable blood pressure charts. These blood pressure charts give you a systematic approach to keeping a record of your blood pressure. 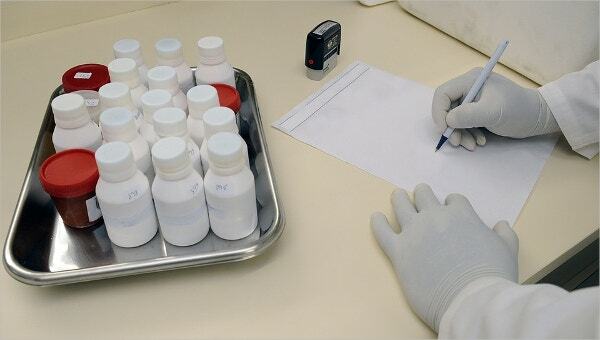 These records can be used to analyze the trend in a person’s blood pressure which can be used by the doctors to determine the status of health of the individual. 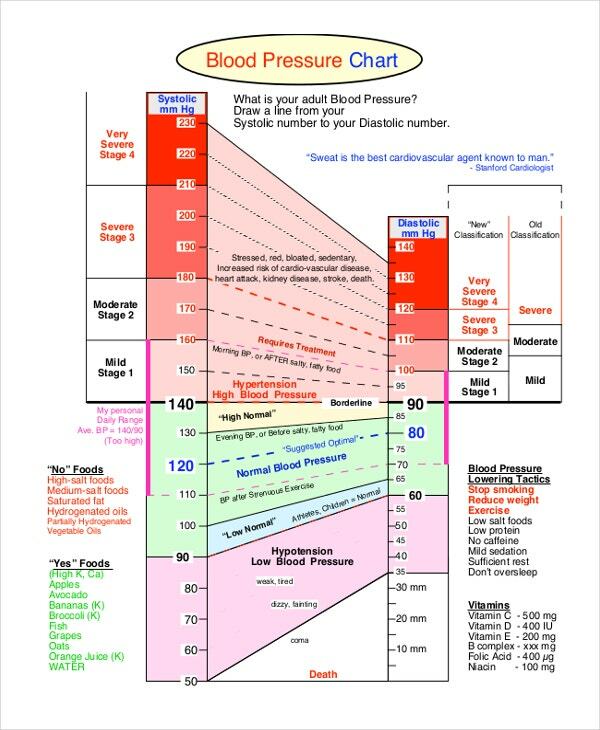 The Blood Pressure Chart Templates are also useful as they help those who have no prior medical knowledge to understand the significance of blood pressure. These charts give useful tips for those who are suffering from abnormal blood pressures. These charts also help in a usage of equipment designed to measure blood pressure. The patient chart templates are useful Excel chart templates which can be used to keep a record of the health of a patient. The printable blood pressure charts can be very helpful in your daily life, especially for those who suffer from diseases that affect blood pressure. These charts are very easy to understand and can be very useful in maintaining a healthy lifestyle.